It’s been home to everything from offices and retail stores to a car dealership and artist colony since it was built in 1917, but just a year ago the historic Victory Center in Midtown Cleveland was standing empty and struggling to stay afloat. Without a tenant, this masterfully restored and LEED-certified 165,000-square-foot building in the heart of Cleveland’s HealthTech Corridor would have quickly gone under. “A year ago the Victory Project was facing the prospect of losing its financing and tax credits,” says Jon J. Pinney, Managing Partner of Kohrman Jackson & Krantz LLP (“KJK”). Shortly after being retained to take over the project management, KJK launched an ambitious plan to save the Victory Center and retain a major employer for the City of Cleveland. In partnership with Rico Pietro, Managing Partner of CRESCO, KJK and CRESCO approached Dealer Tire — on the hunt for a new location for its world-wide corporate headquarters — with a proposal to make the Victory Center its new home. To make the project happen, KJK’s attorneys secured more than $8.5 million in public funding and $15 million in private refinancing, while also negotiating the acquisition of additional land and preserving more than $10 million in both federal and state historic tax credits. 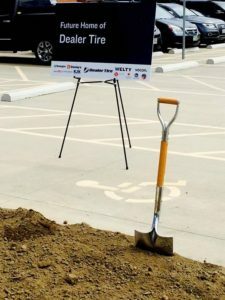 It was the kind of package that Dealer Tire couldn’t pass up, and in January 2016, the company signed a deal to become Victory Center’s sole tenant for the next 20 years, retaining more than 400 jobs in Cleveland with room to add an additional 125 jobs. 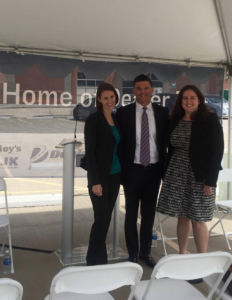 KJK’s Jon J. Pinney, Laura E. Englehart and Jennifer M. Hart formed a dynamic public-private partnership with CRESCO, the City of Cleveland, Cuyahoga County, JobsOhio, Huntington National Bank, PNC, Novogradac & Company, Welty, Donley’s and Vocon to ensure that Dealer Tire would continue to call Cleveland its home. A ground-breaking on the new 650 space parking garage and commencement of construction on the multi-million dollar interior build-out of Victory Center took place on June 29, 2016. Dealer Tire is expected to move into Victory Center in early 2017.